We recommend all case interview clients to start here. Even if you are not an experienced hire. Clients who start here perform significantly better. Follow this unique 110 episode series (see the full list of episodes below), prepared for the Darden EMBA program, to help experienced hires and EMBAs successfully prepare for their McKinsey, BCG and Bain interviews. This is the only case interview training program in the world dedicated to helping experienced hires / EMBAs, by taking into account their very unique challenges, join elite consulting firms. This is a much needed program. If you are an experienced hire or an EMBA you usually have to rely on the advice that has been developed for MBAs and sometimes PhDs. But as an experienced hire or an EMBA you are typically ignored because that advice is not very useful. Age need not be a major factor with the right preparation and determination. We hold the record for placing some of the oldest applicants into McKinsey, BCG and Bain; a 44 years old associate, a 45 years old consultant and a 47 years old principal. We also placed a mother after 5-yrs of maternity leave into McKinsey, that had also never done before, until we did it and a 44 year old into the McKinsey Implementation Group. Lessons from working with those applicants have been built into this program. EMBA classes are not big and therein lies the problem. EMBAs are not the target hiring category for major consulting firms. Schools don’t devote the majority of resources for career advice and career support to EMBAs. It is just a numbers game. The pool is not large enough and most people in that pool are not looking to transition into consulting. The issues experienced hires / EMBAs face, as this series shows, are radically different. They are not even close to the issues that MBAs, PhDs and undergraduates usually face. Following advice for MBAs is a path to failure. The paths/routes to consulting available to EMBAs are substantially greater than that for MBAs, PhDs and even undergraduates. Therefore, EMBAs have less time to prepare because they have full time jobs, they have a tougher path because they have less support and usually more responsibilities (spouse, children), yet they have more options so they need more time to analyze those options. Firms are also not sure about the intent of an experienced hire to join and as a result of the above they have a lower probability of getting in. When we designed this series we decided to put together a program that catered to the limited time available to experienced hires. The reason we decided to put together an audio program, and not a video program, is because EMBAs / experienced hires are generally busy: traveling, coming home and hopefully seeing their children. And the idea was to create a program that will be very easy for experienced hires / EMBAs to consume while they are working. This audio training program is specific to experienced hires / EMBAs. It is not generic in any possible way. 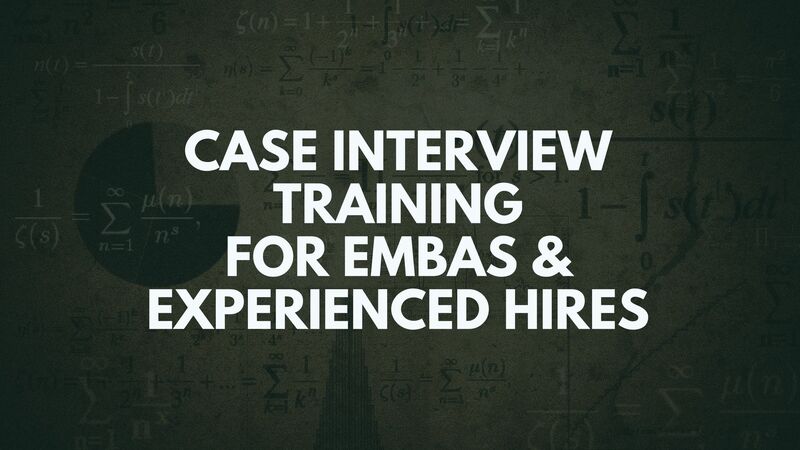 This program will help anyone going through case interview preparation, obviously, and we recommend you listen to it if you have access to it, but if you are an experienced hire or an EMBA, this is designed specifically for you. We also had a very capable student from the Darden class, Tom, co-host this training program. The program is developed in a conversational back and forth style. It is a very detailed series. Most clients have been surprised about the depth of the information provided. It is very prescriptive: this is what you need to do, this is why and this is how you do it, and this is some of the interesting stories that happened with other clients if they did it and if they did not do it. And we spend a lot of time explaining the differences between BTO, the specialist path, the generalist path and implementation. They are all viable paths at McKinsey and we want people to be comfortable going after them. We wanted to make it clear that the generalist path is not the only path available anymore. So many paths are available and, in addition to the general paths, we have recently been focusing on those seeking specialized roles, BTO and implementation. BTO, in particular, is a path we recommend since it fits perfectly for those with a technology background, is a route to the partnership and teaches all the general problem solving skills. So this program is tailored for experienced hire/EMBA candidates who have very little time. The target audience is someone who is in their car a lot, or commuting a lot, and really does not have time to prepare. They want to be listening and they want to be busy doing other things. This program is currently exclusively available to Firmsconsulting Insiders. How important is my school to my application? When does my GPA matter? How important is my experience? What are the firms looking for? What to read to prepare? 5. What do EMBAs need to do differently vs MBAs? What specifically are the firms looking for in EMBA candidates or “mid career hires”? How to deal with being “unevenly qualified”? How to weave in past experience? How to show superior business judgment? 6. What is the truth for minority candidates: Black / Hispanic / Indian / Chinese? 7. What is the truth for female applicants? How do I decide which firms to target? How important are values and fit? How do I evaluate values and fit? What is the networking critical path? 11. How to edit a resume? How does one position oneself to transition from consulting to PE? Should an EMBA apply on-cycle or off-cycle? How does an EMBA balance preparation time with all the other demands? How does one pick an office to smooth out lifestyle issues and when should this decision be made? How does one prioritize time during an EMBA, between studies, extra-curricula activities, travel and recruiting? 13. How to update LinkedIn? 14. When to edit a resume? 15. How are major foreign accomplishments viewed? 16. When/how to write a cover letter? 17. How to build your spike in your profile? What is the core principle and objective of networking? Which type of partners to target? How to reach out/use LinkedIn? What happens when someone responds/views the profile? How do you run the call? What happens after the first call? What happens if no referral offers come through? How does the networking guide this decision? How to discuss your background? Tell me the most memorable thing on your resume? What is the smartest thing you ever did? Why are you leaving your career after such a long investment? Talk me through a weakness? Talk me through a failure you experienced/generated? 24. How to build business judgment? Our commitment to client confidentiality requires some details to be altered.